Installation was easy works perfectly for our needs. Easy to keep clean. No marks are left in the sink. Since it is insulated it makes it very quiet while doing dishes. Dimensions 23.0 In. X 17.5 In. X 9.0 In. I was amazed to find that the sinks came packaged in styrofoam and reinforced cardboard. It was also individually wrapped in a cloth bag for protection. It had great quality grid for the sink bottom and drainer, along with a free hand towel. The sink was so thick that it was heavy and perfect for my new kitchem. Initially, I havent heard of Kraus but am so happy with the quality that I will give my search engine first dibs on Kraus in the future. **The return policy is great with Overstock. This is especially true since I was taken to the bank by *** for a return that cost me 75% of the purchase price of a previously purchased sink that I returned just because I didn't like their product. I will always use Overstock.com in the future. so to put it mildly, the grid is great!! This Kraus sink, plus the extras, were packaged so beautifully that my husband was quite amazed. We are now using the black bag as a laundry bag. Thanks Overstock and Kraus. This sink was the perfect size for our kitchen reno. Our installer was impressed with the quality of the sink and the fact that it came in a bag (much like expensive shoes and handbags!) The hookup to the drain was pretty easy for my husband and the added grid that comes with it is a bonus. It looks great, but it's not very easy to maintain. Sure after cleaning it with Ajax it sparkles like new, but who is going to scrub the sink after each time you use it? Because it is so deep, water splashes from the faucet go pretty high up the sides of the sink and once dried they sort of stain. The sides always look dirty, even if I take a sponge with soap and water and wipe the sides of it down. My parents have a Franke sink, and after seeing the sides of their sink not stained with dried water droplets after each use, I wish I had known that about this sink. We are very pleased with this Kraus stainless sink. It is now installed and looks lovely. When I first ordered a Kraus stainless sink from Overstock it turned out to be larger than what I wanted. The return process was amazingly simple. 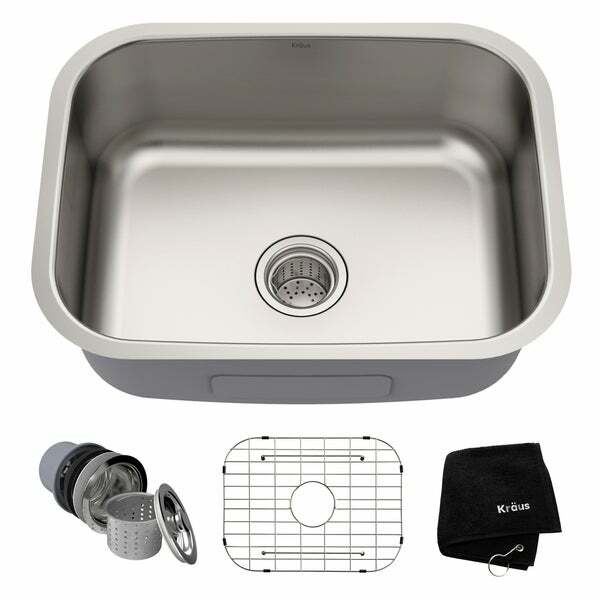 I ordered this Kraus sink instead and carried out the entire return process on line. I printed the return label, which included postage and dropped the box off at a UPS store front. This sink arrived promptly and looks just great. We actually purchase 2 sinks the 23" and the 31 and a 1/2 inch. They are wonderful sinks, well made and the bottom grate is exceptionally made.I like the rounded corners and and the 16 gauge is very sturdy. Couldn't ask for a better sink. This is a great sink! Best quality and the deep strainer cup is an added bonus! Kraus sinks are easy to maintain and have a great finish! You can't beat this packaged deal. I've seen the sink grids alone cost about $60.00. You get the sink, grid and drain, plus a nice plushy towel! Also purchased a larger Kraus sink two years ago and I'm extremely happy with that product too. I did a tremendous amount of research before purchasing this sink. I specifically wanted 16 gauge because it is thicker and stronger than 18 gauge, and thus less likely to show dents, etc. I also wanted to purchase a sink from a manufacturer that had a solid reputation. This sink met all of my requirements. It looks fabulous installed undermount with my granite. The sink was shipped with a drawstring cover over it for protection against abrasions. It also came with the strainer assembly, protection grid insert, and a dish towel. Kraus knows what to do to achieve customer satisfaction. I couldn't be happier. Bought this for my basement wet bar, looks great with granite countertop and paired with KRAUS Single-Handle Solid Stainless Steel Kitchen Bar Faucet. I did not notice any annoying noise when water is running but I do have a pad protecting the sink bowl. The water stains can be avoided if you wipe down your sink after every use. Always skeptical of buying site unseen but won big on this one! Beautiful product, packaged like it came from Tiffany's. Been in service now at least 5 years and is still perfect. The sink is gorgeous and the grid is wonderful. Can't wait to install the sink it looks terrific. Thanks for the free shipping too, a large plus. I just love this sink. Not only does it have quality, but it is almost half the cost of local stores. Would gladly recommend this to my best friends. We are delighted with this find. You talk about pride...this item provees it at every turn. The packaging is like no other i have ever seen. The gauge of the stainless is high and it has a sound deadner as well. I am in the process of installation and expect to get years of good service. This is a very very nice sink .. Our house has an Inlaw suite with a very small kitchen. It looks really nice and the grid with the strainer cup is such a nice touch. I would buy it again if I ever get another small kitchen..
Fabulous! Thanks to all for taking time to give reviews. I listened and couldn’t be more pleased. Our installation men commented on its high quality. High five Overstock! Highly recommend this sink. It is used in an outdoor kitchen; very sturdy, looks great and is not pitting or staining which is common to outdoor sinks. Sink is beautiful! Came very well packaged to prevent scratches or dings. It is very deep and I get a lot of compliments on it! I would highly reccommend it! "I see that the finish is "satin stainless steel." I am wondering what the difference is between that and standard stainless steel and whether it would pair well with a chrome faucet." Our satin stainless steel and standard stainless steel are identical in finish, and as for our chrome finish, it is a brilliant silver color that shines bright and produces a reflection like a mirror. These two finishes do not match however many of our customers have purchased this combination and fell in love with the contrast between the two. Honestly it all comes down to personal preference, what one customer finds appealing another may not, the best thing you can do is advise the customer differences and allow them to make the best decision for themselves. I hope it helps. "Is the drain assembly included with this sink? If not, what is the additional cost?" The parts for the drain are included, if you mean the parts that connect to the drain pipes. It includes a catch basket too. It won't matter if you use a garbage disposal, as it will all have to be replaced. Yes,it is included with the sink. "Will this sink fit in a 25-inch sink cabinet?" No, the minimum cabinet size is 27"
"Does this come with the drain (not the hole, the drain piece that goes in to that)? Thank you!" Yes. It has unique drain basket. "I thought I already purchased a sink just like this one. Where can I find out where it is. " "Can this sink be used with a garbage disposal?" Hello Mary W., using a garbage disposal with this sink should be fine, however you must purchase the kit separately. We recommend working with your professional plummer to have it verified and installed properly. Thanks for shopping with us. The reviews and the price were wonderful.